Happy New Year Coffee Lovers!! My new year’s resolution (pledged, 25th Jan… yeah, yeah…don’t judge me!) is to keep up with this blog a lot more this year. Last year was hectic and relatively uncoffee-filled, which was a sad state of affairs. It has been ten whole months since I last worked in a coffee shop, 8 months since I had my little PhD graduation ceremony, and over a year since my book came out. Unsurprisingly, this has meant fewer coffee related activities to write about on here! Currently, I am existing as the inverse of most social science graduates – instead of being vastly over-qualified but having to work in a coffee shop through lack of jobs in their field of study, I am highly qualified to work in coffee shops, yet I have to work an entry level job in something completely unrelated to my field. It boils down to money. You cannot work in a coffee shop and pay for child care, it just doesn’t make sense. Sadly, that seems to be true the world over! All this is about to change though, for me at least. I haven’t suddenly been able to make a living from coffee again, and I’m not about to give up the day job. But I have been dreaming up a coffee side project, and I am extremely excited about it! 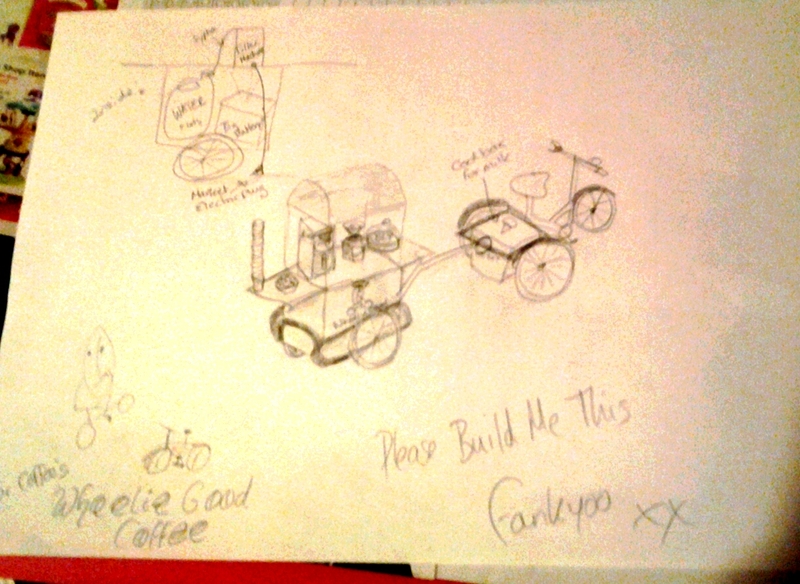 What do you get if you give a coffee geek a tricycle? 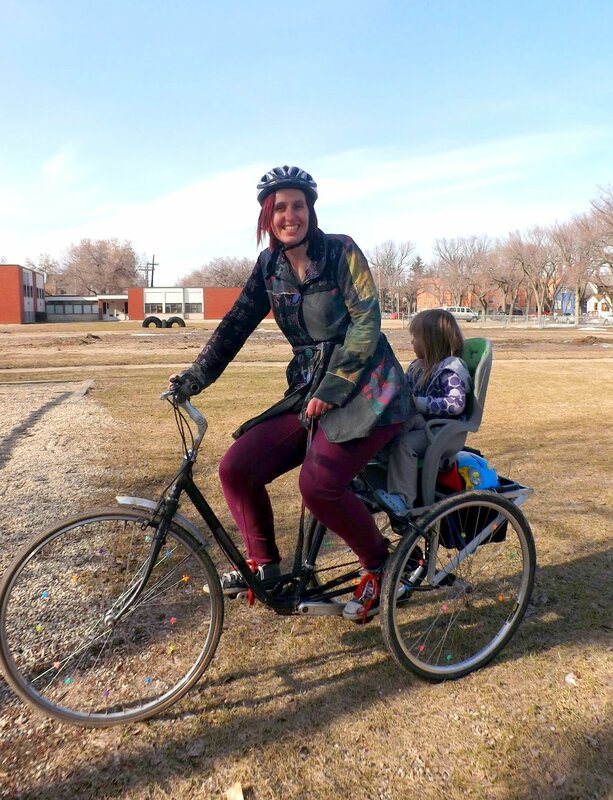 Build a coffee cart on a trailer, attach it to my trike, and serve coffee outdoors in downtown Regina, on the Farmers’ Market and at all the manymany festivals here over the summer. Technical plans. Proof again that I really can’t draw. I am hoping this can be fitted around my work: the market is on weekends, and the festivals tend to coincide with public holidays anyway. Given recent Extreme Temperatures, suddenly my warm office looks much more inviting than standing out in the park on a bike over the winter too! I am applying for the appropriate licenses and permits for street vending at the moment, but assuming all goes well, I intend to position myself on Victoria plaza and Scarth Street, the pedestrian area where nearly all downtown office workers have to pass through to get to the Hill Towers, SGI, Government offices or the large banks, and also access to the Cornwall shopping mall, providing a steady stream of passersby. Of course, there are other coffee shops downtown, but as yet, nothing outdoor or mobile. As I have found through being a downtown office worker for the past few months, it is virtually impossible to dash out and get NICE coffee from one of these coffee shops in your 20 minute coffee break from work – queues and barista-ing takes way too long unless you happen to work next door. Our office block is just that bit too far away. But if there was a coffee trike parked outside it….. Recent, sad developments in the coffee world on my doorstep (better explained on my other blog) led to a long and involved conversation on Twitter, bemoaning the lack of good, convenient coffee downtown. When I ventured the idea of Wheelie Good Coffee on there, my twitter stream went completely mad and I got put in Twitter jail for the first time ever! (That is, it blocks you temporarily for sending over 100 tweets in an hour – I wish I’d got a screen shot!). There are a lot of local folk who would be very supportive of this venture I think. It will take a while to get organised, but the market doesn’t go back outdoors until May, so May seems a reasonable start date to aim for. Until then, it’s permit applications, business plans, a mentorship with the Canadian Youth Business Foundation (a wonderful organisation that includes me both as being an honourary Canadian, AND still “youth” – which made me feel great! ), helping my lovely Carl actually build the thing, coffee blend designing… oh, and the day job. Here’s Twyla the Trike – the engine of my new business!